Sierra Stinson runs the Vignettes gallery, which shows off work from the comfort of her own home. She also has a mighty fine coif. We had a chance to chat with her about curating, getting introduced to a number of great Seattle artists and what one thing she would change about the art and investment scene here in town. Jake Uitti: For those who don’t know can you tell us a bit about Vignettes and what inspired it? 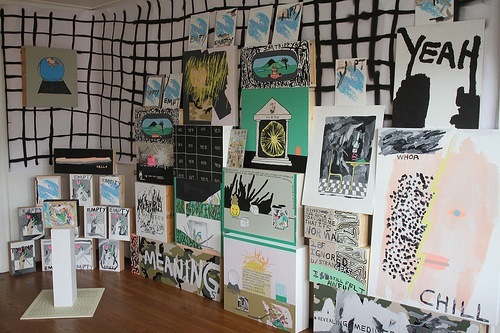 Sierra Stinson: Vignettes sprouted out of a simple idea three years ago: To give people a place to exhibit their work in an alternative space – our apartment. Venues like it have always existed, it wasn’t a new idea but it felt like we needed it here. I found myself living in an empty studio apartment with minimal furniture with a long list of artists who fit in that limbo between cafes, galleries and museums. Some of them exhibited in all of the above and some none, I began asking those I knew and liked as humans to have a one-night show. We had 24 exhibits in our first year. 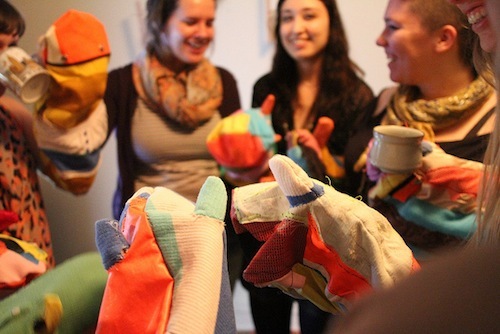 No neighbor complaints – we actually met more of our neighbors through hosting Vignettes so we kept it going. JU: Did you look to other places for inspiration for the project, or did you just sort of wing it as you went? What surprised you the most as the project/gallery grew? SS: I didn’t at first. We simply got some clamp lights for the first show, grabbed a couple bottles of wine and invited our friends over. I figured a one-night exhibit every two weeks would be a good start and my list of artists who I was excited about was growing. As word spread I met individuals such as Robert Yoder, Amanda Manitach, Klara Glosova and Susan Robb who over the years I have featured at Vignettes as well as collaborated with on other projects. SEASON and NEPO House were galleries I learned about after Vignettes began and through them I was able to define more of what I was doing, we were all home galleries but we each had a different purpose and goal. However, I believe we all sprouted out of the same need. When Vignettes began I had no idea that we would end up here – nearing our 3rd year anniversary. I didn’t realize how nourished it would be by the community. JU: What is the need that all these galleries, in your mind, sprouted up because of? SS: I believe we each felt that we could provide a space/venue for artists whose creations we loved and were excited about. Artists we didn’t necessarily see in galleries or being written about. I cannot speak for Klara and Robert but I feel that they both nourish and support artists. They are selecting them because they love what they do and like that individual as well. It is really an honor to be involved with so many amazing artists and individuals in this city and beyond. JU: Who are some of the artists you’ve featured? And what do you want to do with Vignettes that you haven’t yet done? SS: I have featured 50+ artists in the last three years including group exhibits and collaborative shows. They range from artists who taught me at Cornish, were recent graduates, still in school, never having gone to school, from outside of Seattle to living next door to us. Artists like Rumi Koshino, Lindsey Apodaca, Jenny Heishman, Frank Correa, Isaac Quigley, Joe Rudko, Maggie Carson Romano, to name a few! Vignettes feels very malleable and my next project within it will launch next year. I want to work more on the import/exportation of art and continue to nourish the amazing artists that exist in this region as well and share artists work from elsewhere here. JU: Oooo! Can you tell us more about this new project?? SS: It will be the marriage between much of my history and interests. It will include homes, a collection of all mediums, artists, writers, and further the dialogue about new ways to represent an artist and their work. JU: What is the most inspiring thing to you about Seattle? And what is one thing about the city you wish could change? SS: If I could change one thing it would be that the money from the tech industry goes more towards local artists and collecting from within the region rather than LA, NY or abroad. There’s a long list of artists that cannot support themselves here through their art and I wish they could. We have lost a lot of great artists to NY and LA in the last five years. Seattle is inspiring every day. It is one of the most beautiful cities I’ve ever lived in. I’ve met many individuals here who I consider to be my family and many who I am honored to know and work with. It is small in just the right way, you can act in many roles throughout the community. It is a place where you can explore all of your interests. You can be an artist, a curator, a writer, all in one.